There is a “silver-lining” to nearly every negative situation in which you find yourself. If you open yourself up, you can find the positives and then use your experience and knowledge gained to help others…hopefully, creating a “greater good” in the universe. I hope the following story, lessons learned, perspective, and insight are informative. The aftermath of a very personal health situation brought me in to see Lori Thomsen at the Hruska Clinic. She took me on as a patient one year ago. Realizing quickly that I was a candidate for PRI Vision intervention, I was assessed by Ron Hruska and Heidi Wise the same day and prescribed a specific pair of PRI lenses. I filled the prescription and followed up with Lori the next day. Lori guided me through a program consisting of upright exercises. (Exercises in the Vision program are primarily upright activities, because you are learning how to use the floor to propel yourself forward through all phases of the gait cycle, using the PRI Vision lenses as a tool.) Coincidentally, at this same time, I was beginning to more fully appreciate the need to get my own clients “on their feet”. Admittedly, I was designing exercise programming primarily for the supine, side-lying, and all-fours positions. Having received Lori’s instruction for my own upright activities, I was able to more adeptly implement upright activities with my own clientele, especially when it came to teaching L mid-stance. I believe I have been able to avoid major pitfalls/setbacks and progress my clients more quickly than I might have, if I had not been a patient of Lori’s. The most enlightening piece of information Lori taught me was the use of the quad during mid-stance. 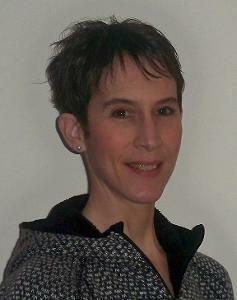 As a member of the PRI faculty, Lori teaches the Pelvis Restoration course. She frequently refers to her “3 Amigos”: L abdominal wall, L quad, and L hip. It wasn’t until I was a patient, when she actually took me through the integration of the “3 Amigos” on MY body, that I fully appreciated the quad in L mid-stance. PRI programming accentuates “sensing” or “feeling” your left heel making contact with the ground in mid-stance, because those in LAIC patterns tend to bypass the L heel altogether during the gait cycle. Their L foot tends to be in constant plantar flexion, so the first part of the foot that hits the ground on heel-strike is the arch or the ball of the foot (late mid-stance to early toe-off phase). Maybe we take the client/patient through proper heel-strike phase, but in mid-stance, we should be teaching them to merely “sense” or “feel” their left heel vs. “press” or “dig” their left heel. Back to the quad… In L mid-stance, the quads should be in an eccentric contraction phase around the knee joint, counter-balancing the eccentric contraction of the hamstrings. Because the knee is slightly flexed in mid-stance, the quad is on a slight stretch but holding tension, getting prepared for the propulsion phase where the concentric action of the quad takes over (stretch-shortening). There is a “springiness” to the quad, unless the L foot is not firmly planted or the L hemi-pelvis is anteriorly tilted. In either of these cases, the quad is acting more concentrically. I like the word “springiness”, because it reflects my most recent reflections on mid-stance. “The first modal peak [of the vertical component of ground reaction forces (GRF)] occurs during the first half of support and characterizes the portion of support when the total body is lowered after foot contact.” (Hamill and Knutzen, Biomechanical Basis of Human Movement). This is mid-stance. When you really think about this, walking is hard stuff!! Each leg has to be able to “accept” 75-80% of your body weight in able to propel forward and not evade this difficult task with the above-listed extensor and pulling muscles. Again, back to the quad… “If you can feel your L quad, Lilla, your L abs should automatically be kicking on”, Lori says during our session. The quad is one of the markers for integration from the ribcage to the pelvic inlet through the pelvic outlet to the femur. I’m in L stance with pelvis rotated left, L foot flat on ground, upper body rotated right, reaching out and down with left arm to facilitate both trunk rotation and thoracic flexion, a bit of thoracic abduction to help find L abs. I’m doing everything right, but still no abs. When I “press” down into the ground, as suggested, I am concentrically activating my quad, and it is difficult to posteriorly tilt my pelvis and reach the knees forward. However, when I think of “dropping” my weight onto my L leg (feeling those GRFs and a “springy” eccentric quad), I can reach my knees forward with posterior pelvic tilt, effectively bringing my pelvis under my ribcage so that they are in a position to access the side abs. YEAH and whew! I didn’t mention the third amigo, the L hip (Glute Med), which comes into play in the frontal plane, balancing the forces of the IC Adductor. I am certainly not downplaying the role of this amigo in L mid-stance! I only wanted to emphasize the important role of the quad (a muscle that is not given as much “press” in teaching L mid-stance), because Lori’s instruction certainly helped me, both personally and professionally. Attached are 2 short video demonstrations. I encourage you to read the article itself, not only because it is interesting but also because it raises PRI questions about horses. I continue to dive deeper into the physiology, anatomy, and biomechanics of both horse and rider, in a passionate effort to understand how 2 asymmetrical beings come together to produce fluid, balanced, floating movement in the world of equestrian disciplines. This is a rather lofty goal I have set for myself, because this type of movement is rarely achieved, EVEN at the elite levels of Dressage. CLICK HERE to read more! Christy Peterson (PRC) and I gave a riding clinic April 6 and 7 at her facility (Riverside Physical Therapy) in Ord, Nebraska. This was an ideal setting, because Christy’s facility is located on her farm which has an outdoor arena for riding. Participants trailered their horses in from the surrounding area. All were competitive riders (mix of Western and English disciplines), some of whom were competing at the World level. After PRI evaluation and treatment, followed by some PRI-based exercises designed specifically for riders, each rider saddled up! They were tasked with integrating what they learned off-horse to on-horse…challenging but powerfully effective. 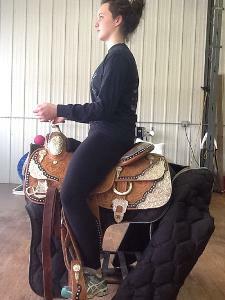 Riders must be able to move their seat, arms/hands, and legs independently of each other in order to guide and lead the horse successfully and perform well. This requires extraordinary body awareness, subtle controlled movements, and centering to the ground (not the horse) atop a powerful animal that has its own asymmetries. Riding is a complex sport and often referred to as an artform. It has been my experience over the past 3 years that many of the cues traditionally used by riding trainers are misinterpreted by riders and promote an extension pattern. I cringe when I hear these particular cues: “sit tall”, “chest up”, “shoulders back”. Interestingly, a term that both Christy and I use to highlight and promote flexion for riders is the word “collection”. Riders know and understand this term, because it is used to describe a state of posture and movement of the horse. “Collection”: moving back to front; getting hind legs under the belly for powerful movement, balance, and control; top line of the horse lengthened and bottom line shortened. So, when we get a rider into an All-Fours position, a 90-90 Hip Lift, or a Supported Standing Wall Reach and ask them to “collect”, they will instinctively reach their knees forward with a posterior tilt of the pelvis to “move from behind” and activate their hamstrings. Pretty cool! It is also a helpful cue for the seated posture of riders in their saddles…lumbopelvic flexion with the front of the hips open. Christy and I both learned from working with each other, and the participants seemed to appreciate the dual point of views. We are in the process of planning more clinics, since we had such a positive response. Each participant received an individualized 2-hour session with both Christy and I.
I hope to extend these types of clinics across the country…beginning with NE, MD, VA, PA, NC. If you are interested in hosting one of these types of clinics, please contact me at Lilla@MovementControlSpecialists.com or visit www.EmpoweredRider.com. Posted by Lilla Marhefka (PRT).